NEW ORLEANS – The 2018 USTFCCCA Convention is right around the corner. Be sure to take advantage of the early registration window before it closes in 11 days! Early registration ends Friday, November 30 at 11:59 pm ET. If registered before the clock strikes midnight on December 1, the price is $375 compared to $450 (There is a $75 increase for those registering late). As part of registration, coaches have access to breakfast, lunch and dinner on Tuesday, Wednesday and Thursday, as well as admission to every major event, including the USTFCCCA Coaches Hall of Fame Induction and The Bowerman Presentation. 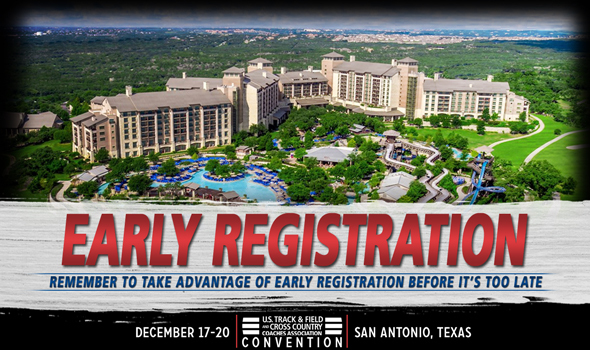 The 2018 USTFCCCA Convention will be held December 17-20 at the JW Marriott San Antonio Hill Country Resort & Spa in San Antonio, Texas.